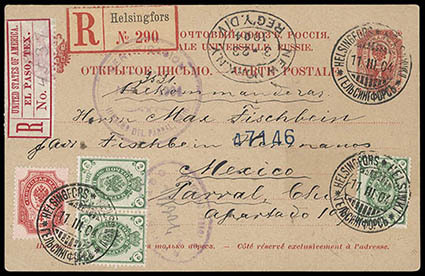 El Paso, Tex., registry label with large Gothic serif letter and manuscript number "4537" affixed on 1904 Russian 4k postal card to Mexico bearing Russia 2k green (47) single and pair, and 4k rose (41), all tied by Helsingfors (3.11) cds, New York (3.23) transit oval, purple El Paso (3.30) backstamp, Very Fine, Census No. EP-19. Scott No. FX-EP1a Estimate $500 - 750. 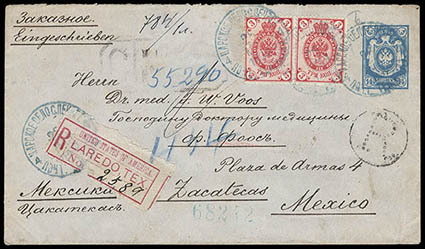 A SCARCE REGISTERED POST CARD USE FROM FINLAND TO MEXICO VIA THE UNITED STATES. 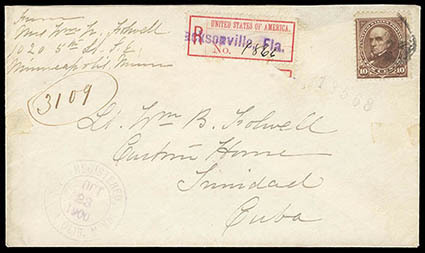 Jacksonville, Fla., purple straightline handstamp on label with manuscript "1866" number, affixed on cover bearing 10¢ orange brown (283) tied by oval cancel, reverse with Minneapolis Minn. (1.23.1900) origin cds and purple Jacksonville (10.27) transit, Trinidad, Cuba (11.1) arrival cds; light tape stains at sides, Very Fine and choice, ex-A.R.T. collection; with clear 2004 P.F. certificate. ONE OF THE FINEST OF ONLY 5 RECORDED HANDSTAMPED JACKSONVILLE REGISTRY LABEL USAGES. 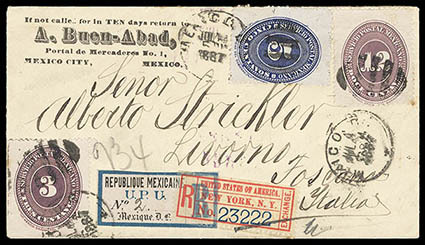 Laredo, Tex., registry label with ms. "2589" number on blue 1892 Russia 14k registered entire to Zacatecas, Mexico uprated with 3k pair tied by blue Russian (5.25) cds, black dotted "R" in circle handstamp, reverse with New York (6.18) and Zacatecas (6.27) backstamps, Very Fine, Census No. LA-2. Scott No. FX-LA1; $1,000 Estimate $500 - 750. THE EARLIEST OF 27 RECORDED LAREDO, TEXAS REGISTRY LABEL USAGES. 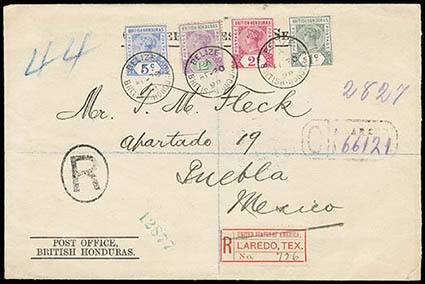 Laredo, Tex., registry label with ms. "726" number on 1898 registered cover from British Honduras to Puebla, Mexico bearing British Honduras 1c, 2c, 5c and 12c (38-39, 41, 44), tied by three strikes of "Belize, British Honduras, AP 20 98" cds, reverse with New Orleans (4.26) cds, purple "Laredo, Tex. Apr 28 1898" straightline and Puebla (5.1) arrival backstamps, Laredo transit registry handstamp; tiny corner tear, clean and Very Fine, Census No. LA-26. Scott No. FX-LA1; $1,000 Estimate $300 - 400. 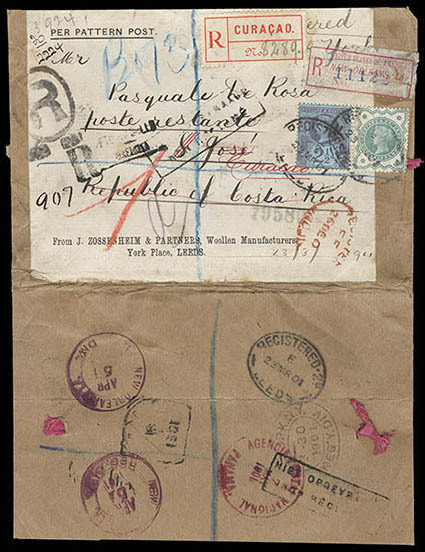 Naco, Arizona, registry label with script handstamp name and "5636" number affixed on Argentina 15c entire uprated with Argentina 4c orange (126) strip of three tied by "Buenos Aires 11 Jul 1907" cds to El Paso Tex. and then forwarded to Mexico, Buenos Aires black on white registry label, New York (3.4) backstamp, purple El Paso (8.9) cds, purple Naco, Son. framed registry backstamp, Very Fine, Census No. NA-3. Scott No. FX-NA2; $3,500 Estimate $1,500 - 2,000. ONE OF ONLY THREE RECORDED NACO, ARIZONA EXCHANGE LABELS USED ON COVER, THIS BEING ONE OF ONLY TWO HANDSTAMPED EXAMPLES. New Orleans, La., registry label with "11122" number on 1901 registered "Pattern Post" wrapper with address label and intact cords from Leeds, England to San Jose, Costa Rica, redirected via Panama to Curacao, bearing GB 1½d and 2½d cancelled by oval "Leeds Registered 23 MR 01" datestamps, red London (12.26) transit oval, reverse with New York (3.30) and New Orleans (4.5) transits, partial Curacao arrival datestamp and additional framed "Niet Opgevraase/Non reclamé" handstamp in French and Dutch, returned to sender with Curacao registry label and Panama (5.7) backstamp transit; cover opened out for display and a few minor peripheral faults, F.-V.F., rare and distinctive usage, Census No. NO-3. Scott No. FX-NO1; $600 Estimate $200 - 300. (New Orleans, La. 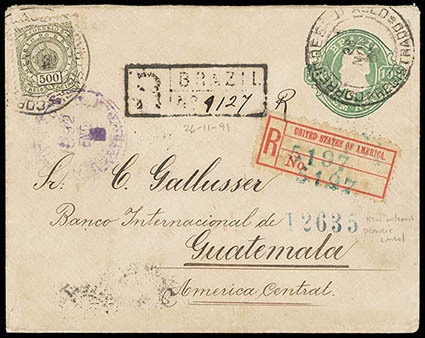 ), utility black label greenish "5197" number on 1891 Brazil 100r postal entire to Guatemala uprated with 500r olive (95) tied by partial San Paulo (11.26) cds, matching registry handstamp adjacent, reverse with Brazil (11.27), New York (12.25) and New Orleans (12.29) transits, purple Guatemala Jan. arrival cds, F.-V.F., Census No. NO-5. Scott No. FX-NO4; $525 Estimate $150 - 200. 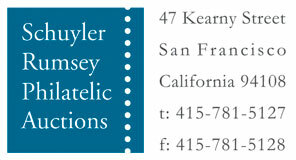 ONE OF ONLY 12 RECORDED NEW ORLEANS BLANK NAME REGISTRY LABEL USAGES. 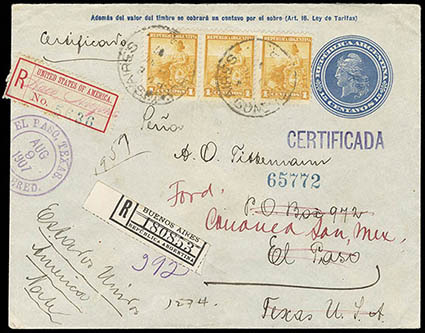 (New York) 1887-1896 Mexico Registered Covers with New York Registry Labels, group of 4 each having New York N.Y. registry label comprising 1887 Mexico City with 3c, 5c, 12c numerals to Italy, 1887 Mexico City with 10c, 10c numerals on post card to France (ex-Schimmer), 1893 Guanajuato with 5c, 10c (3) to Argentina, 1896 Durango 4c entire uprated to Denmark, Very Fine and attractive group. 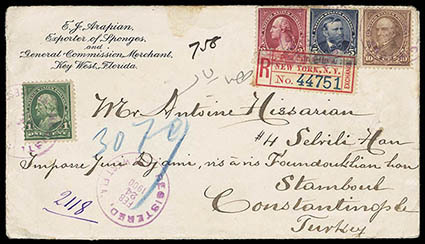 New York, N.Y., used with 1¢, 2¢ 5¢ and 10¢ Bureaus (279, 279B, 281, 282C), tied by purple "Key West Fla., Registered, Feb 24 1900" cds to Constantinople, Turkey, reverse with New York (2.28) transit and Constantinople (3.12) arrival cds, Very Fine registered use with a four-color franking. Scott No. FX-NY1a Estimate $200 - 300. 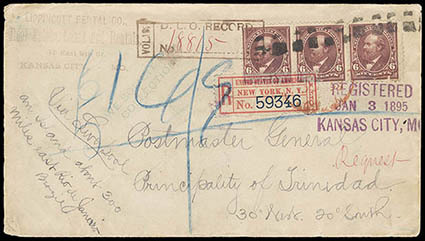 New York, N.Y. "City", registry label with "59346" number on 1895 cover from Kansas City, Mo. to Principality of Trinidad, South Atlantic bearing 1894, 6¢ dull brown (256), strip of three, tied by roller grid cancel, endorsed "Via Liverpool, an Island about 300 miles east Rio de Janeiro, Brazil", purple three-line "Registered, Kansas Mo." purple postmark, New York (1.6) transit backstamp and New York "City" registry exchange label affixed, red London transit oval, Rio de Janeiro (2.6) transit backstamp, returned to sender with D.L.O. (9.18) backstamp and record handstamp; right 5¢ faults, some cover wear, F.-V.F., an exceptionally rare destination valid only for two years. Scott No. FX-NY1b (unlisted) Estimate $150 - 200. The Principality of Trinidad was declared in 1893, when the American James Harden-Hickey claimed the uninhabited island Trindade and Martim Vaz in the South Atlantic and declared himself as James I, Prince of Trinidad. According to Harden-Hickey's plans the island would, after being recognized as an independent country, become a military dictatorship under his leadership. Brazil, with Portuguese support, pressed a successful claim to Brazilian sovereignty in 1895.